As explained in the Brief History of Allotments in England, the level of rural poverty increased significantly with the privatisation of common land through land enclosure acts, and this was a major factor in the pressure to provide allotments for the poor in the late 18th century. Land enclosure had been slowly occurring from around the 14th century, but the pace was enormously accelerated at the start of the 18th century with approximately 5 million acres of common land being enclosed between 1700 and 1860. The South East of England was generally affected later than most other parts of the country: Windsor Forest, Old Windsor (Sunningdale was part of Old Windsor at the time) and Sunninghill were all enclosed in 1817. Berkshire Record Office has a very useful web site on enclosures in the county. The effects of enclosure on the ordinary man in the countryside, a surplus of labour resulting from the return of soldiers after the Napoleonic Wars and the first signs of automation in the form of the threshing machine all contributed towards the Swing Riots which spread across southern England in 1830 and 1831, including Berkshire. By the 1830s and 1840s the idea of allotments was still in its infancy, and it is probable that less than 25% of parishes in Berkshire and Surrey had any form of allotment scheme. In Berkshire the majority of sites were in fact clustered at the western end of the county where nearby Wiltshire was a relative hotbed of activity. Allotments were typically provided either through the individual initiatives of local benefactors or by the efforts of clergymen / churchwardens, principally via the charities for the poor that they administered. An example of the latter was the trust known as The Penny Royal Cottages which was set up with funds left in the will of Alexander Morley (1594). It included 47 garden allotments vested in the vicar and churchwardens at Old Windsor. Although the number of allotments across England grew quickly around the middle of the century the first real surge started in the 1870s, rising from a figure of 243,000 in 1873 to 445,000 in 1890. Berkshire reflected this national trend with 5,007 plots in 1873, growing to 10,231 by 1890. This rise coincided with the greater appearance of allotments in urban areas. The available evidence appears to indicate that the first allotments in Sunningdale were situated off the A30 between Halfpenny Lane (next to the Majestic Wines store) and the railway line on the site of what is now the Clarefield Court warden-assisted apartments (indicated by the red place marker on the map below). The area is marked as allotment gardens on an 1861 estate map of St John’s College, Cambridge, a significant land owner in the area. The site was rented out at £6 per annum, subject to the land being required for development. The allotments lasted until circa. 1890 when a property (pictured) was built on the site, the initial occupier being the College’s local agent, Robert Keirle. William Raffles Flint, the vicar of Holy Trinity in Sunningdale, was interested in the provision of allotments for the poor, making an unsuccessful attempt to rent the Clarefield site in 1863. He made his feelings known during the prize-giving at The Cottagers’ Flower, Fruit & Vegetable Show in July 1875 when he expressed his regret that villagers without gardens were unable to take part, and he stated his hope that a piece of ground could be obtained one day and let out as allotments. 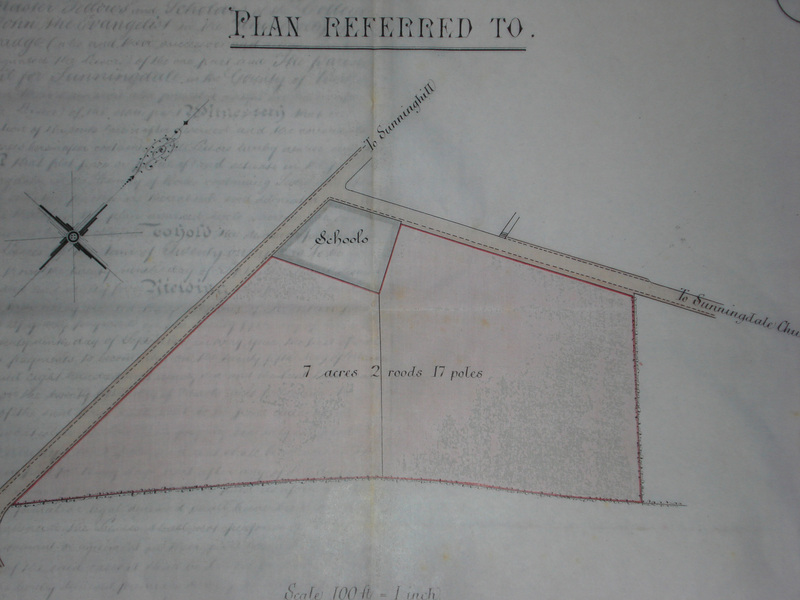 He eventually managed to lease several pieces of land from St. John’s College, including the field adjoining Church Road and Station Road (the current allotment site – blue place marker on the map) which he sublet to the villagers as allotments. The lack (so far) of a supporting tenancy agreement may indicate that this was initially a private arrangement between the Bursar at St. John’s and the vicar. The site came into being sometime between 1875 and 1882. William Raffles Flint, a nephew of Sir Stamford Raffles (the founder of Singapore), died in 1884 and he was succeeded by the Reverend A. Cree who quickly recognised the popularity of the plots and increased them; there were around 40 plot holders by the late 1880s. Briefly, there was a third allotment site in Sunningdale. St. John’s College, through its agent, Robert Keirle, let a small piece of land on Chobham Road, just past what is now Richmond Wood on the way to Chobham (green place marker on the map above). There were at least 8 plots there from 1896, possibly earlier, up to 1932 when the site was leased out for development. Returning to the current allotment site on Church Road, the owner of Coworth Park Estate, Sir William Farmer, a successful international retailer and local benefactor who had contributed significantly towards the rebuilding of Holy Trinity church in 1887, acquired a lease of Broomhall Farm and the allotment site in 1888, taking over the management of the plots from the vicar. The period of his tenure coincided with the provision of allotments in nearby Windsor (1892) and Richmond (1893). A significant change occurred with the advent of the Local Government Act (1894) which created the system of Urban and Rural District Councils. This act dictated that a Parish Council was required in any parish with a population of 300 or more. As Sunningdale’s population was well in excess of this figure – it was 1,409 by the turn of the century – Sunningdale Parish Council came into being in 1894. The first council meeting was held on December 31st of that year under the chairmanship of the Reverend Cree. Under the 1894 act the new councils were given the power to provide land for allotments, and this topic was the second item on the agenda at the initial Parish Council meeting. The Council, which was looking for land for both allotments and a recreation ground, wrote to St. John’s College on 7th January, 1895. It may well be that they were already aware that Sir William Farmer, himself very briefly a member of the Parish Council, had already given notice to quit his tenancy of Broomhall Farm and the allotment field at Michaelmas 1895 due to alleged financial difficulties. Discussions over the following months led to an agreement that the Parish Council would lease the allotment field plus “an area of rough meadow adjoining Wardour Lodge” (the current site of the Parish Council office and the Broomhall Recreation Ground). The total size of the allotment site was in excess of 7 acres for which the Parish Council agreed to pay an annual rent of £2 5s per acre. The lease was eventually signed by the Council on 14th January, 1896 and legally came into effect in February. The idea of having a recreation ground was meanwhile put on hold. Although the above aerial photograph was taken in 1932 after various building changes had taken place it does give an idea of the approximate extent of the proposed area which stretched from the school to the Firs on Church Road and bordered Station Road, south west of the school. It included what is now the school playing field. Briefly, while on the subject of the photograph, it is worthwhile noting that the old Roman London to Silchester road, also called The Devil’s Highway, ran through this area although there is some debate as to its exact location. Some locals say that the line of trees which separate the allotments from Broomhall Farm (bottom right-hand corner) marks the road, but maps indicate that it is slightly further over (approximately 10 metres) on the farm land. The name dates back to the Saxon invasion after the Romans left in the early 5th century. The Saxons could not believe that the road had been constructed by mere men. The existing allotment holders on the Church Road site were informed that they retrospectively held their plots from the Parish Council with effect from Michaelmas, 1895. Applications were sought from individuals who were looking for 20 pole allotments. A full size plot today in the UK is typically 10 poles, which is equivalent to 300 square yards or 250 square metres, although the average size in Sunningdale is now just under 5 poles. The annual rent was 6d per pole, payable in two instalments – on Lady Day (25th March) and Michaelmas (29th September). An Allotment Committee, consisting of several members of the Parish Council, was set up in 1896. This was a demonstration of the Council’s enthusiasm for allotments, as legislation which required councils to have allotment committees was not passed until 1922, and from 1925 it was in fact only applied to councils with populations of 10,000 or more. It produced a report in February 1898, stating that there were 66 plots, 19 @ 20 poles and 47 @ 10 poles, and it recommended that rents be reduced to 4s 6d for 10 poles, and to 9s for 20 poles. Initial complaints from plot holders, and indeed from the Parish Council to St. John’s College, concerned the state of the fencing. This subject became a perennial topic from 1896 right through to the 1980s. It is not clear what the full extent of the fencing was around the end of the 19th century; one painting of Church Road from 1905 shows a mixture of iron and wooden fencing. The majority of complaints about the state of the fence over the next 30 years were focused on damage caused by children in the school playground and youths playing football there (presumably this is the fencing which separated the site from the school and from Station Road). Other events of note in the early years included: damage to crops in 1899 caused by sheep (presumably from Broomhall farm); a request to move the school cesspit further away from the school and onto the allotment field after an outbreak of diphtheria among school children in 1906; a deputation of plot holders complaining about a person who was putting sewage on his plot in 1909; and the sudden discovery one day, also in 1909, by a Mr. Fedder that they had started building on his plot! This was the Village Hall. He and other allotment holders who were affected by the building were each subsequently paid £1 compensation by St. John’s College. Sunningdale Village Hall, viewed from the south end of the allotments. 1916 saw the introduction of awards by the Parish Council for the Best Cottage Garden & Allotment Garden. There were vacant plots in the same year, a surprising fact given the general nationwide clamour for allotments during the First World War (1914-18). Meanwhile, Mr. Levy of Wardour Lodge wrote to the Parish Council at the start of the following year with a patriotic offer to make 2.5 acres of his pasture land available for the growing of potatoes; he would arrange for the land to be ploughed and manured. Although the Parish Council made the offer public, it has not been possible to discover to what degree it was taken up. The lease of the allotment field expired in the same year (1917). The period of this initial lease had not been trouble-free. The College had aspirations to develop both Broomhall Farm and the allotments, but fortunately there was no property boom in those days. Among the unsuccessful plans was an 1896 scheme to build a road through the allotments from the point of Parkside Road / Church Road to Broomhall Lane. Probably, as part of this plan the College had tried during the early years to persuade the Parish Council to agree to the allotments being moved to the nearby boggy field behind the CMI building at the bottom of Church Road but the Council had resisted. However, several small pieces of land were gradually nibbled away to accommodate some development along Church Road: the post office and shop next to The Firs (1898), two houses (1900) and the Village Hall (1909). This left circa. 6 acres which was now the subject of a second 21 year lease. The winter of 1918-19 was very wet – there were reports of flooding in various parts of the parish – and difficulties were encountered in letting some plots because of the wet conditions. Flooding was again an issue several years later, but the view on this occasion was that it was principally due to the ditch between the allotments and Broomhall Farm being filled in, plot holders being blamed for dumping rubbish there. It was eventually cleared. In 1920 the District Auditor pointed out to the Parish Council that it was losing money on the allotments – and by law expenses relating to the lease of the land must be recouped. This led to the rents being increased, although only back up to the original 1896 rate. They were now to be paid annually rather than 6 monthly. Demand for plots exceeded supply in 1921, resulting in the two people who had multiple plots at that time each being forced to give one of them up. The remainder of the 1920s and 1930s was largely quiet. St. John’s College increased the rent in 1929, but this was not passed on to the plot holders by the Parish Council. It was noted in 1934 that there were 77 plot holders, and the lease was renewed again in 1938 just before the start of Second World War (1939-45). Two years later the Parish Council received patriotic offers of land for allotments from two unspecified individuals. It declined the offers but agreed to put any prospective applicants in direct touch with the people concerned. Unfortunately, no further mention is made of this subject in the minutes of the Parish Council meetings. The immediate post war period saw the first mention of land being required for a playing field for Holy Trinity school. The County Council proposed to purchase up to 4 acres of the allotment field from St. John’s College for this purpose. The subject was discussed for the next 3 years, during which time the Parish Council made a number of unsuccessful attempts to obtain 3 acres of land elsewhere to compensate for the imminent loss. Meanwhile, plot holders in the affected area were given notice to quit. However, the Ministry of Education then put the plan on hold in 1950, rumoured to be due to funding issues, and the notices to quit were temporarily rescinded. It was to be the early 1960s before the idea of a school playing field was resurrected. Another problem for the allotments occurred in 1949 when the Village Hall trustees wanted a 50x100ft section of the allotments fronting Church Road for a car park. It came to nothing, but seven years later, when the police were constantly being called to sort out parking problems outside the hall, the plan was resurrected. Eventually the hall settled for a car park behind the building in 1958 and just one allotment holder lost his plot. The National Association of Parish Councils was formed after the Second World War, and over half the councils in the country, including Sunningdale, had joined it by 1952. It produced a number of advisory handbooks, including one on managing allotments which was published in 1951. This publication is a useful read. The 1950s saw many vacant plots, typically about 20 out of a total of 80. While this reflected the national picture after the end of the Second World War when enthusiasm for allotments waned, the uncertainty surrounding the school playing field, and later the entire site, almost certainly exacerbated the situation. Apprehension about the future of the whole site was felt when, as the existing lease approached its expiry date in the late 1950s, the agents for St. John’s College indicated that they were objecting to the zoning of Broomhall Farm (for planning purposes), and therefore they were only prepared to extend the allotment field lease for one year, up to Michaelmas 1959, until the matter was settled. The Parish Council declined an offer to include the area that would eventually be set aside for the school playing field, thereby reducing the size of the allotment field to circa. 3.5 acres. In 1959 the lease was once again extended by one year. This period of uncertainty eventually came to an end when the College put a 21 year lease on the table in March 1960, an offer which was accepted. This good news was “celebrated” when the Parish Council sanctioned the installation of a water supply. Water was a subject that had surfaced periodically over the years: in 1906 and 1933 the feasibility of sinking a well had been investigated but it was considered too expensive; in 1943 the Berkshire War Agricultural Committee stated that mains water could not be used – only cows were allowed mains water during wartime; and further unsuccessful reviews took place in 1950 and 1953. The plot holders assisted the installation by digging a trench on the site to receive the pipe. Only one tap was provided and, unsurprisingly, there were soon requests to extend the pipe and add more taps. Rents were doubled in 1962, rising from 6d to 1s per pole. This was effectively the first rise that the Council had made since it became responsible for the allotments in 1896, prompted in part by the fact that they had been losing money for close on 20 years. Other interesting facts from the 1960s included: an application to keep pigs from one plot holder in 1963 – although it appeared that he was going to get the go ahead there is no confirmation in the Parish Council minutes; the donation of a cup by William Pack, a member of the Parish Council, for the best kept allotment in 1964 with the addition of prize money in the following year; signs of more demand for plots in the late 1960s; periodic incidences of theft; and problems with dogs wandering around the site. High inflation was the main theme of the 1970s. Its influence was initially felt in the summer of 1973 when the College gave the Parish Council notice to quit the allotment field at Michaelmas 1974, offering to enter into a new agreement albeit with a fourfold increase in rent. The Council eventually agreed to the new terms, leading to a trebling of plot holders’ rents, excluding pensioners. Major increases in rent continued throughout the decade and £1 per pole was eventually reached in 1981. On the credit side the Parish Council managed to fight off a huge rise in rent that was proposed by the College’s agents in 1980, having it reduced significantly with the aid of the District Valuer. Away from these painful financial episodes, events during the 1970s included: several bonfires which caused damage either to adjacent plots or to neighbouring gardens – bonfires have been another perennial problem over the years; a period of vandalism (1974); the extension of water pipes with additional taps – some plot holders helping once again with the installation; a letter of complaint about a hedge overshadowing his plot in the south east corner of the site from a certain Mr. Alan Titchmarsh (of later gardening fame) who had a plot circa. 1977-81 when he lived in Beech Hill Road; complaints about the state of what had become a communal tip on the eastern side of the site; and the emptying of the school swimming pool after a problem – but not down the drains for some reason – leading to some adjacent plots being flooded and crops lost. The number of worked plots continued to decrease during the 1970s with the figure by 1981 standing at an all-time low of 38. 1985 commenced with a decision to increase the plot holders’ rent to £1.40 per pole (95p for OAPs) after St. John’s College increased the Parish Council’s rent. More importantly, it was followed almost immediately by the return of fears for the future of the allotment site when an application was made by the College’s agents and a developer to build 29 4-bedroom houses on the site. The possibility of an alternative allotment site (the boggy field behind the CMI building again) was mentioned by the agents but rejected by the Parish Council. 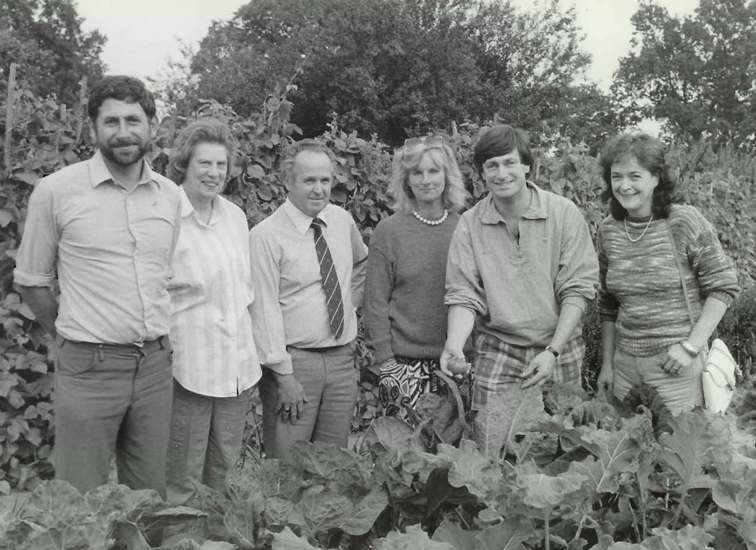 Alan Titchmarsh, now a celebrity and author of The Allotment Gardener’s Handbook in 1982 (out of print), was invited along by the Sunningdale Action Committee to lend his support, as shown in the picture below. However, the Parish Council decided early in 1986 that they had to give the plot holders 12 months notice to quit just in case the application succeeded. Fortunately, it was announced in April 1986 that planning permission had been refused. Away from the crisis, Alan Titchmarsh judged the best allotment competition for several years in the mid-1980s, while the cattle herd from Broomhall Farm managed to get onto the site early one morning in the late spring of 1988 and cause some havoc. The possibility of development continued to be a distinct threat to the future of the site, but in the second half of 1988 the idea was floated, and eventually agreed that, in return for permission to build three houses on the area of land adjoining Church Road (0.9 of an acre), the Parish Council would acquire the freehold of the rest of the site (circa. 2.55 acres) on condition that it was only used for allotments or as a recreation ground. During the latter part of 1988, while negotiations were still ongoing, the plot holders, unaware of developments and anxious about what may happen, decided to form an Allotment Holders’ Association (established in early 1989) to fight their cause. A meeting was held in February 1989 to inform the plot holders of the agreement; affected plot holders were to be relocated elsewhere on the site. The developers also agreed to remove the communal green waste heap (something of a headache for the previous 6 years) and to install additional water taps. The land transaction was completed at the end of the main 1989 growing season (October 1989) and the affected plot holders were relocated. Rents for the 1990/91 year were reduced to £1 per pole but the concession for pensioners was removed. The pictures below, courtesy of Peter O’Kill, show the stages from cultivated plots through to the early development of the three properties. Click on an image to see a larger version or hover just to see the caption. 1990 and early 1991 saw a period of investment by the Parish Council, as a number of major improvements were made to the site under the stewardship of councillor Norman Davis. They included: the installation of gates; the creation of a car park area; new water tanks and taps; the making of “roads” on the site to allow access to vehicles, and the clearing of the ditch. Despite the work on the ditch, flooding continued to be a problem in wet winters. Investigation of the problem led to a drain being laid during 1994 and 1995 from the car park to the ditch at the southern end of the site to help deal with water run-off from the Village Hall and allotment car parks, and the ditch itself was once again cleared. As tranquillity gradually returned after the upheavals of the late 1980s and the significant changes of the early 1990s, the Allotment Association decided to put itself into mothballs in 1997. The next 10 years were relatively quiet until 2007, which was one of the worst growing seasons on record. Plot holders had to contend with an influx of deer as well as the atrocious summer weather. The deer came almost daily, gorging themselves on many crops, particularly beans and lettuce. Fortunately, the Parish Council subsequently agreed to put up deer netting along the southern border of the site, adjacent to Broomhall Farm. This was installed in January 2008 with assistance from some of the plot holders. In addition, an extra water standpipe was put in on the eastern side of the site, in part paid for with the residual funds in the account of the dormant Allotment Association. During 2008 an anonymous donation of £4,000 was received to cover agreed improvements and maintenance work. The projects which were principally carried out during the autumn period of that year included: the replacement of the fence between the Allotment site and Village Hall car parks; the planting of beech hedging and elaeagnus shrubs in the car park; a significant reduction in the height of the hollies and other shrubbery along the southern border in an attempt to improve the light levels for adjacent plots; the installation of an additional water standpipe on the southern side of the site; some maintenance work on the existing water tanks; the replacement of the notice board; the sprucing up of the allotment seat; plus the funding of a best mixed plot prize for 3 years. This was followed in February 2009 by the installation of deer netting along the eastern boundary to stop them coming in from the adjacent garden. This was removed in 2012 when the neighbouring property installed a wooden fence along this boundary. 10 years after the the moth-balling of the Allotment Association a site representative was appointed in 2007 who helped to ensure that these improvements in and around 2008 were successfully implemented. He stepped down in March 2010. More recent work on the site has included: dealing with an oak tree which came down in a storm in February 2014, damaging one plot and the deer netting; plus the installation of a further water standpipe on the western side of the site in May 2014. Meanwhile, the demand for plots had started to grow from around 2004 in line with the national trend, with young mothers being particularly attracted to the idea of growing their own organic, pesticide-free crops. For the first time since pre-war days there was a waiting list which grew to a peak of 19 in 2008 and early 2009. However, from 2010 the demand started to fall, once again in line with the national trend. In the autumn of 2016 there were a small number of people on the waiting list. There has been a general trend to split the larger plots into two, as many people have other calls on their time – job, family, other leisure activities, et cetera – and are therefore unable to maintain full size plots. In fact, the only two remaining 10 pole allotments were both split during the course of 2013. There are now currently 64 plots on the site, varying in size from as little as 2 poles up to 6.3 poles, with an average size of just over 4 poles. One pole is equal to an area measuring approximately 30 sq yards or 25 sq metres. In 2017 the annual rent for a standard plot (up to 5 poles) for new plot holders was £18. The history of Sunningdale Allotments parallels the national scene in many ways. The plots were originally provided by a landowner (St. John’s College, Cambridge) and a vicar (the Reverend Raffles Flint) with moral consciences. Subsequently, plot holders benefited from the desire of the early Parish Councillors to play their part in the move towards the public provision of allotments. A long period of relative local stability and steady growth coincided with the nationwide explosion of allotments from the late 19th century through to the end of the Second World War. Unfortunately, this was followed by 45 years of relative insecurity, as the increasing pressures to develop land both locally and nationally, the impact of inflation and the relative waning in enthusiasm for allotments as standards of living rose, all served to threaten the future of allotments. Sunningdale was fortunate to be well-served by the members of a shrewd Parish Council when the future of the site was threatened in the late 1980s, ably lobbied by the Allotment Association. Many sites across the country were not so fortunate. The picture since 1990 has been one of local stability although the number of allotments across the nation has continued to fall slightly despite the marked increase in demand in recent years. It remains to be seen what the future may bring. There will undoubtedly be continuing pressures on allotments everywhere, requiring vigilance and goodwill in equal measure if a right, which many people struggled hard to win over a period of around a century and which their successors have laboured to maintain over the last 100+ years, is to be protected. Hopefully, Sunningdale is well placed to weather any turbulence. Author – Brian King with contributions from Peter O’Kill. Last updated on 21st February, 2019. Can you help? I am still trying to find out precisely when the current Sunningdale Allotment site came into existence. If you have any information please contact me. I am particularly keen to locate copies of the Holy Trinity Sunningdale parish magazine between 1876 and 1882.